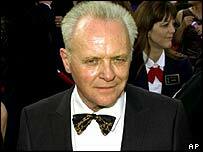 Silence of the Lambs star Anthony Hopkins has married for the third time in a private ceremony in California. The Welsh actor wed antiques dealer Stella Arroyave, 46, at his clifftop mansion in Malibu on Saturday - St David's Day. He wore a daffodil in his buttonhole while the bride clutched a bouquet made up of the Welsh national flower. Guests included Mickey Rooney, John Cleese and Sir Anthony's 88-year-old mother Muriel. Sir Anthony met his wife two years ago while he was out hunting for furniture. He divorced his second wife Jennifer Lynton in May 2002 after 29 years of marriage. They had been separated for a number of years and he said they had "drifted apart". Sir Anthony, 65, made his home in Los Angeles, becoming a US citizen, while Ms Lynton remained in the UK. His marriage to his first wife Petronella Barker, with whom he has a daughter, lasted three years. Sir Anthony is probably best known for his role as the cannibal Hannibal Lecter in Silence of the Lambs. He won an Academy Award in 1992 for playing the chilling psychopath created by author Thomas Harris and went on to reprise the character in Hannibal and Red Dragon. He has also been nominated for another three Oscars for The Remains of the Day, Nixon and Amistad. Sir Anthony will next be seen alongside Nicole Kidman and Ed Harris in the drama The Human Stain.